10am - Never needing to set the alarm on my Timex, we open our eyes sometime between 9:30 and 11am. Upon rising, we the next 30 minutes watching CCTV, Communist China's lone English program that was surprisingly high on information and low on propaganda. We treat this unit of time as part of our introduction to the complexities of Chinese Culture. The 90 minutes may (and far too often may not) include showering, teeth cleaning and the application of hand sanitizer. 12pm - Food, always on our minds, is next on our agenda. We drift (though still at a pace 10X faster than our Chinese counterparts) down to the local supermarket to buy fruit, crackers, noodles and bread. 12:05pm - After lunch we pursue an afternoon activity (is this beginning to sound like summer camp? 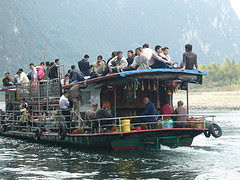 ), which included on different days: rock climbing in the mecca of Asian climbing; boating up and down the Li River; riding bicycles through remote villages; and wandering aimlessly for hours around town. 3pm - Journey towards a vendor for my daily dose of Peanut M&Ms. 5pm - Part of the backpackers staple diet is going on-line (which is often followed by bi-polar tendencies based on the amount of email received). 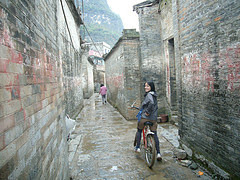 6pm - Despite the fact that 46 restaurants exists in Yangshuo, we went to the same one every night for dinner (we're suckers for being locals). The Karst Cafe offered splendid Red Curry among other tasty treats. Often, we shared a meal with fellow backpackers which always leads to envy induced conversations about their travels (my passport is nearly full, but I keep getting the feeling I've never actually been anywhere until now). 8pm - A $200 massage for $5 (need I say more?). 10pm - Our evening begins winding down with a bottle of Great Wall Cabernet, Yatzee and a book (Kari: Atlas Shrugged, Josh: All Families Are Psychotic). And sometime between Jay ending and Conan's first guest, we sleep. 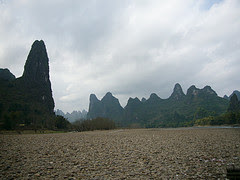 A few more pictures of Yangshuo can be found here. It is kind of like a cross-cultural camp where you get to pick the itinerary and there are a million possible electives. So now you're in Beijing eh? I just looked at ALL your photos.